The Odyssey 2.4G Diode Laser from Ivoclar Vivadent, Inc. represents the latest diode laser technology available for soft tissue modification and preventive care. Featuring a unique fiber management system and the newest innovation, a wireless power control, the Odyssey 2.4G is the most efficient soft tissue laser in dentistry today. Powering the design of the Odyssey 2.4G Diode Laser is a passion for better dentistry made possible through the use of the most sophisticated, precise, and minimally invasive technology available. The Odyssey 2.4G Diode Laser now enables dentists to easily and safely perform many soft tissue procedures that previously required referral to a specialist. 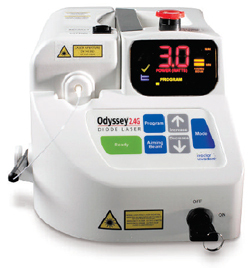 The Odyssey 2.4G Diode Laser reduces postoperative healing time and yields fewer post-operative complications including instances of infection. It is used for minor surgical procedures, eliminating bacteria from the area during the procedure. Stitches are rarely needed for laser wounds and many soft tissue procedures around the gum tissue can be completed without anesthesia for greater patient acceptance and comfort.